We don't know when John Mercer was born, as the first we hear about him is on the 15th May 1713 when he was apprenticed for five years to clockmaker Thomas Barrett of Lewes for a premium of £20.00, a relatively high premium. He was described as being the son of Thomas Mercer, yeoman, of Mendfield (Ninfield? ), Sussex. An apprentice was normally fourteen years of age and served a term of seven years, being freed from his term at the age of 21. The fact that John was to serve only five years, might indicate he was sixteen years of age rather than fourteen. This means he was born between about 1697 and 1699. The likeliest birth I could find was the baptism on the 17th August 1697 of John, the son of Thomas Mercer of Dallington and his wife, Anne, nee Plummer. Dallington is just a couple of miles from Ninfield. John was free from his apprenticeship in 1718. He seems to have settled not long after at Hythe, where he was married on the 4th July 1724 to Sara Gibson. He was a few days short of his 27th birthday. Mike Pearson's book "Kent Clocks & Clockmakers" tells us that a lost watch by John Mercer was advertised for in 1736, that he is mentioned in a deed in1738, and that he was Mayor of Hythe in 1756,1768, 1772, 1777 and 1779. He appears to have died in 1782. 1. Eight-day clock by John Mercer the elder of Hythe, Kent, in its original oak case. Surprisingly the clock remained within five miles of its making till 1880. In December 1757 John Mercer took an apprentice names Ambrose Stokes for seven years at a premium of £30 – again a high premium. The more celebrated the maker, the higher the premium he could charge. A high premium suggests a clockmaker in great demand. Nothing is known later about Ambrose Stokes, so he either left the trade or spent his life working as a journeyman for another master. We might have expected a clockmaker in business as long as John Mercer (something like 60 years, depending on when he retired, if he ever did) to have taken more than one apprentice in that time. But by the 1750s he had at least three sons, who would have trained and worked under him. Apprenticeship bonds were not usually taken out between father and son, or, if they were, were just a paper formality with a tiny premium, on which no tax was payable, and so they would not show up in the apprenticeship records. The only national records we have of apprenticeships come from the Inland Revenue records of taxes paid on them, and these records survive to this day. Tax collectors have long memories. No tax paid, no record. We know John and Sara had several children, at least three being sons, who took up the clock trade. Mike Pearson details some of them. William was born about 1730 and became a clockmaker at Hastings by 1725 when he was married, then by 1761 at Folkestone and then from at least 1775 at Hythe, where he died in 1791. Thomas Mercer was born about 1730 and worked at Folkestone from 1751. He took two apprentices there: Henry Goddard in 1752 and James Andrews in 1764. Goddard's premium was a massive £60; that for Andrews was only £20. Was it a sign that Thomas was prospering in 1752 but less so in 1764? Goddard later was in business himself at Tenterden but by 1767 had moved to Dover. What became of Andrews we do not know. Thomas Mercer later worked at Hythe, and was almost certainly another son of John Mercer the elder. John Mercer junior was born about 1738, almost certainly the son of John senior. He was married 1780 to Ann Grigsby. 2. The hood of the John Mercer clock retains its original caddy, when so many have been removed. Side 'inspection' windows were common on early longcases in the south. Several longcase clocks have been recorded by John Mercer senior, as well as watches and a lantern clock and a bracket clock. One particular longcase clock of his, which is pictured here, is interesting in so far as it has a bit of its history written on a paper pasted inside the backboard. It is neatly written in a charming female hand with that old-fashioned type of pen that had a replaceable push-in nib and that you had to keep dipping into the ink well. It dates from a time when schools actually taught children how to write in real writing with joined up letters - and with no ink splashes!. People of my age remember them anyway! They were very handy for spearing into the desktop like a small javelin. Or you could nick the end of the wooden shaft with a pen knife, fit a folded paper flight and throw them across the classroom like a large dart, hoping to impale your enemy. They made real pens in those days. It was a joy to learn to write with them - and we could do apostrophes!
. (for?) .. him. It was then over 60 years old. Lyminge is about four miles north of Hythe. Amazingly by 1880 the clock had not moved further than that since its making, which was not 'over 60 years' earlier but over a hundred and sixty years before! The 'chimes' were added in 1896 from a longcase clock from Penrose, which is in Cornwall and about as far away from Lyminge as one can get without crossing the sea. By 'chime' the label writer meant 'strike', but of course this clock was built with rack striking and therefore always had a strike capability. In fact the clock had had its normal bell strike replaced ( in 1896 as we now know) by a horrible Victorian coiled going. The fact that the label writer knew the gong came from a clock at 'Penrose near Helston' suggest to me that this clock was then in that locality, in deepest Cornwall. Perhaps the purchaser had retired to Cornwall, or had a country residence there. We will never know. 3. The twelve-inch dial of the John Mercer clock, dating from about 1720, has now been cleaned and re-silvered. The maker would be proud of it. Gong striking was not really introduced in longcase clocks till the late 19th century, so if it did come from a Penrose clock in 1896, that cannot have been a very old one. The writer presumably tried to indicate its different sound by calling it a chime. Gong striking was very popular around 1900, when most bracket clocks were built with that type of gloomy strike sound. This sound was popular with our great grandparents and seems to me at home with aspidistras, antimacassars and the stale smell of heavy velvet curtains, half-closed to save the furniture from fading in the sunlight, mixed with the aroma of mothballs, essential to save the curtains from vermin. 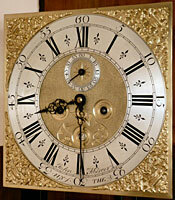 Many longcase clocks were changed from bell strike to gong strike about this period. If he could have heard his clock gong striking, John Mercer would have turned in his grave. But today he can rest in peace as the gong has now been replaced with a normal bell for the strike, just as John Mercer made it. Today the clock strikes with that rich, clear and bright tone of a bell, a tone that welcomes in the sunlight that over two centuries has faded its oak case to a golden yellow.